1. Get good quality bronze mallard. Long fibers with grey roots (it’s a softer part of the feather and easier to mount) and tips that tend to stick together (you don’t want the tips to fray or splay out). You must bind the mallard to the hook over the grey part of the feather to avoid it splitting and/or rolling out of position. 2. Use two matching quills when selecting your mallard slips. Your slips will meld together much easier that way, and look good too. Otherwise, it can be a battle to get them to work together. Use fairly thin feather sections to start with (about ⅛” or so per section). It will make the material less likely to bunch up or roll and ruin your wing. This width of the mallard slips can be increased as you get more comfortable with your techniques, if desired. 3. Try to keep the head area free of any other materials where you will apply the wing. It’s really tough to set mallard on top of another material. Careful tying of the throat materials is important so as not to create a “bump” at the head that must be overcome when applying the wings. You can create a nice flat platform with your (flattened) thread, if necessary. 4. One method of mounting is to use a left side slip for the near side, and a right side slip for the far side. I align the ends and “hump” them together as a single unit (remember tip #2?). Then apply it to the hook as one wing, using a soft loop to hold it in place and then tighter wraps to secure. The key to this method is to have these slips of mallard hold against one another and retain the shape of your wing. 5. You can also apply the wing slips one at a time. I’ve started using this method more and more as of late where I apply the far side and hold it with a wrap or two. Then apply the near side slip using that far side section as a brace. You can slide the near side wing right up to your brace and then use your fingers to adjust the final position. It’s amazing how you can sometimes just squeeze the wing sections into proper alignment after applying them in this manner. 6. Both of the methods described will also work if you want to reverse the mallard slips and work with a right side feather section for the near side wing. This will give a more downswept appearance to the wing. I happen to prefer a little upswept appearance at the end of the wing, and the left side = near wing follows how I apply married strips on full dress salmon flies. So it keeps it consistent for me. But many tyers go with the right side = near wing, so feel free to experiment to see what looks good and works for you. 7. A final method of applying a bronze mallard wing is also probably the simplest: using a single slip of feather and folding it in half before tying it on. Select a ⅜” or so width of mallard. Pull it out so that it is perpendicular to the stem. Strip it off with a quick pull – do not cut it, as you want a bit of the stem to remain to help hold it together. Alternately, you can snip the section out with scissors, but then you will have to work around the stem stubs (sometimes a trying proposition, as they do tend to get in the way). Fold the slip in half and give it a bit of a hump so that it will hug the body of your fly, and attach to the hook with a soft loop of thread to hold it. Position it with your fingers and then follow with a couple of snug wraps to set your wing in final position. 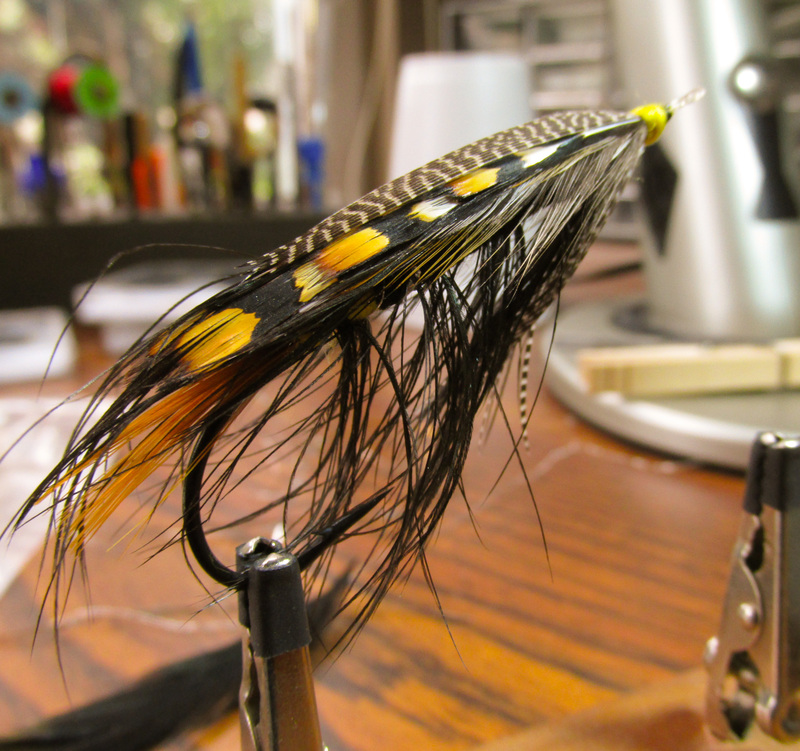 So there are a few thoughts on the most intimidating aspect of dressing traditional Spey flies. With a little practice, I think you will find that bronze mallard is not that difficult to work with. This entry was posted on February 25, 2009 at 12:00 pm	and is filed under Salmon Flies, Steelhead Flies, Tips & Techniques, Tying Notes. You can follow any responses to this entry through the RSS 2.0 feed. You can leave a response, or trackback from your own site.